"This research provides foundational knowledge which enables future research questions on developmental trajectories, such as when an individual might switch from developing into a worker to developing into a queen," says Adrian Smith, a research assistant professor at NC State University and head of the Evolutionary Biology & Behavior Research Lab at the North Carolina Museum of Natural Sciences. "Beyond furthering our understanding of these social insects, the work also offers us a little more insight into how the natural world works," says Smith, who co-authored a paper on the research. "We think that's inherently valuable and, as the images associated with this research show, nature can be visually fascinating." 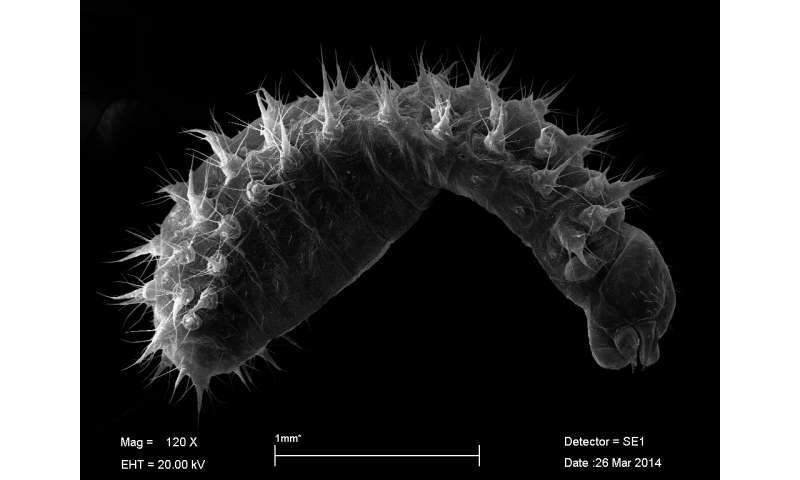 This research determined the number of larval developmental stages, or instars, by measuring hundreds of larval head widths and body lengths and by identifying stage-specific anatomical features through scanning electron microscopy. 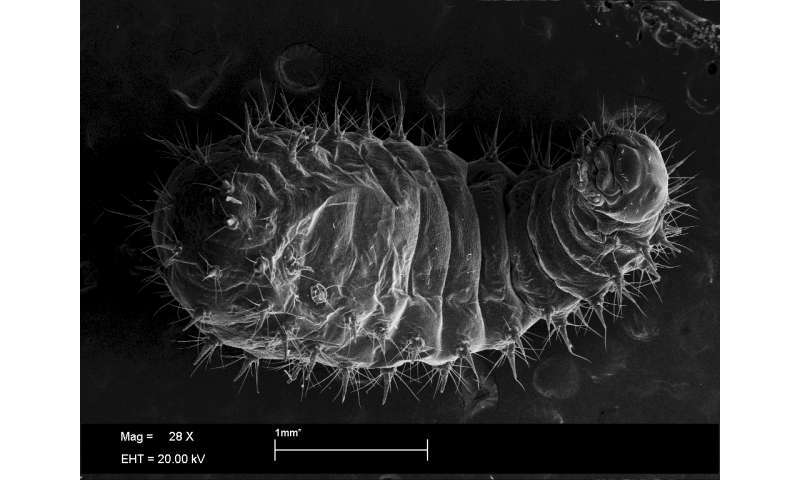 These images revealed an amazing complexity of body parts such as four "sticky doorknobs" on the backs of first and second instars, used to adhere the larvae to nest walls and ceilings, complex "frustrum with spire" hairs of second and third instars, and silk-spinning "pseudopalps" of third instar larva. Beyond providing the first categorization of larval stages for these ants, surprising results from the work include discovery of the "sticky doorknobs" which were previously studied in only one other ant species, developmental anomalies such as the appearance of additional doorknob protuberances, and the discovery of a larval parasite found in the gut of a third instar larva. 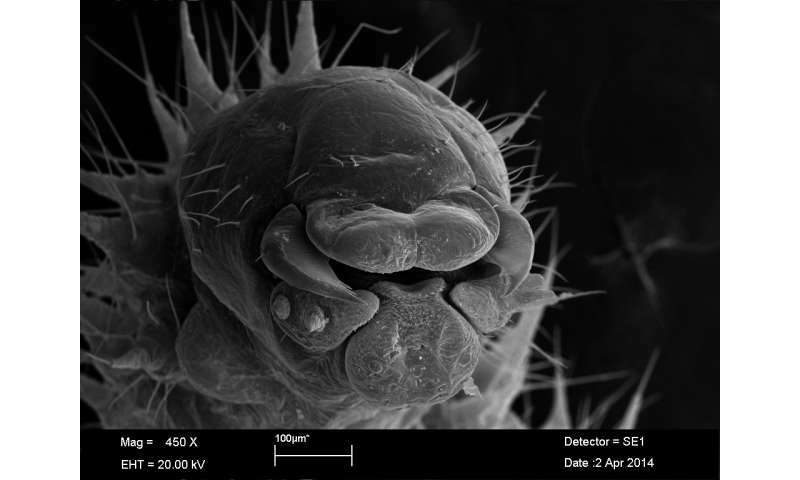 The journal article, "Larvae of trap-jaw ants, Odontomachus Latreille, 1804 (Hymenoptera: Formicidae): morphology and biological notes," is published in the journal Myrmecological News.